Three years have passed since Norway received its first F-35 fighter plane during a rollout ceremony in Texas on September 22, 2015. On Friday, September 21, 2018, three new F-35 fighter aircraft landed at the Ørland Air Station, their home base. The Armed Forces now have nine F-35 stations on Norwegian soil. Updated figures for combat aircraft acquisition now confirm that unit costs for Norwegian combat aircraft are declining. "After receiving nine F-35 aircraft, we can continue the planned training so that we reach the goal of delivering operational combat airpower with the F-35 in cooperation with the F-16 from 2019," said Colonel Hans-Ole Sandnes, commander of Ørland Air Station. It is planned that Norway will have six fighter aircraft in the year to 2024. The aircraft that arrived in Norway are now the last three for 2018. In November last year, the first three aircraft arrived in Norway. The procurement of aircraft will be completed and the weapon system will be fully operational in 2025. The F-35 system is a formidable capacity that will greatly strengthen the Armed Forces’ ability to react quickly over long distances. 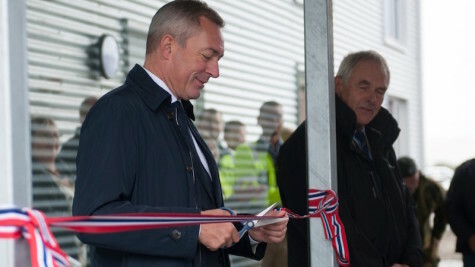 On September 17, Defense Minister Frank Bakke-Jensen visited Ørland. He agreed that the last of four new buildings were completed. The increase in staffing has led to new needs and comprehensive accommodations for the civil servants, officers and soldiers who will serve at the airport. The deployment projects began with the rehabilitation of headquarters buildings A and B four years ago. The work continued with the arrival of another four new barracks buildings - two for conscripts and two for command and officers. The first one, which opened this week, has 72 beds and is the last of the four new buildings. In total, these projects have supplied 520 new beds to the Armed Forces. Construction and facilities required for the reception and operation of the first new combat aircraft in Ørland have been completed. Further construction will be completed as aircraft deliveries continue. When the decision to establish the operational base on Ørland was taken in 2012, there were about 600 military staff at the airport. When all F-35 are delivered in 2025, it is estimated that the Ørland base airline will employ between 1,000 and 1,100 people. Adding the total number of soldiers and guards involved in the station will raise this total to 1,700. "Both due to experience learning, cost reductions under the program and increased production rates, we expect the price of future production series to continue to decline," says the Program Director of the Kampflyprogrammet (New Fighter Program), General Morten Klever. “The unit price for the F-35 varies due to many factors such as currency. All production batches have different prices. Prices are falling as production rates per series increase. Norway's first aircraft had a unit price (aircraft and engine without additional equipment) of 114 million US dollars. The aircraft that Norway received this year (2018) cost about $ 95 million -- about $ 1.5 million less than planned. The dollar exchange rate also affects Norway's costs. When the combat aircraft acquisition was adopted, an exchange rate of 6.47 kroner was assumed for the period. If this exchange rate is also taken into consideration today, Kampflyprogram's estimates also show a reduced cost for the acquisition of F-35. “Based on the current exchange rate, the expected cost is still within the price-adjusted cost frame for the combat aircraft program. This because we have so far managed to reduce the cost of the acquisition measured in dollars. The acquisition of the F-35 has a cost framework of 83.3 billion 2018 kroner," Klever said. Based on the acquisition approved by the Storting, Norway plans to procure up to 52 F-35 combat aircraft for the defense of Norway. This number has been verified through analysis conducted in cooperation between the Norwegian Defense Research Institute and the Combat Aircraft Program. The latest analysis is based on updated threat assessments that underlie the current long-term plan. The operational characteristics of the F-35 make this plane suitable for solving all the missions that Norwegian fighter aircraft are expected to face in peace, crisis and war. The aircraft has high survival capabilities against advanced threats, it has advanced sensors and modern weapons, which in turn make the aircraft very well suited to perform roles under all lighting and weather conditions. These roles include fighting targets in the air, on the ground and in the sea surface, performing support tasks such as information retrieval and monitoring as well as strategic operations. In addition to the nine aircraft in Ørland, Norway also has seven F-35 fighter aircraft at Luke Air Force Base in Arizona. These are used for educational and training purposes. The education activity at the training base is continuing.